Hillary Clinton finds herself on the defensive, doing rope-a-dope, against certain charges from both the media and Bernie Sanders. Where Sanders is concerned, Clinton’s Achilles heel is her relationship with Wall Street. Specifically, Clinton is vulnerable with her contention that she has never been influenced by the money from Wall Street that has been paid to her as speaking fees or cash contributions to her campaign and associated SuperPACs. Clinton contends that there is no evidence that she has never changed a vote or a policy position because of money from Wall Street. There is some validation to this because so far no one, including those on the right wing, have been able to relate any policy positions that she takes to the millions that she has received from Wall Street. Some 87 percent of likely New Hampshire primary voters ages 18 to 29 said they would vote for Mr. Sanders in the state’s primary on Tuesday, compared with 13 percent for Mrs. Clinton, according to a UMass-Lowell poll conducted Feb. 1 to 3. The conundrum for Clinton is that even if it may be true that she has never been influenced by Wall Street, it’s too big a stretch for young voters to believe. It’s as if the university president at an SEC university said that the scholar-athletes were among the university’s most serious students. So here’s a suggestion to Hillary Clinton and her campaign. Simply say that while it is her belief that she has never been influenced by Wall Street money, she understands that there is a wide-spread perception that she has been. Furthermore, she is as determined as Bernie Sanders to reign in the excesses of Wall Street and she knows that she will be taken more seriously if she is no longer taking money from either Wall Street or other big corporate interests. If Clinton would take this step, there would be several clear benefits. 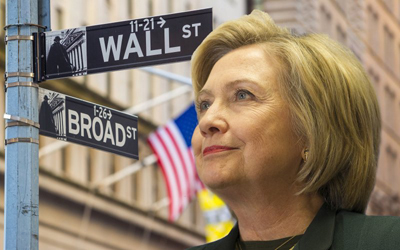 First, she would have much “cleaner arguments” in her effort to curb Wall Street abuses. Second, she would be building immunity to Sanders’ charges that she still is too cozy to the Street. Third, it would counter the argument that she’s always “late to the party” when it comes to acknowledging her mistakes. It took her thirteen years and two presidential campaigns to finally apologize for her 2002 Senate vote endorsing President George W. Bush’s already-failed strategy with Iraq. And who can forget the pain, all through the summer of 2015 and into the fall, until Clinton acknowledged that she had made a mistake in how she handled her e-mails while Secretary of State. And her initial answer to Chuck Todd’s question about whether she will release the transcripts of her paid speeches to Goldman Sachs seems to indicate that we’re in for a long wait before they see the light of day. For progressives, Clinton is often “right” on the issues, but in far too many cases it takes time for her to get there. It would be great if she could catch up with Sanders on Wall Street. What if she went a step further and was able to get President Obama to say that if he was running now, he too would not accept Wall Street donations. What a coup! Like many, I currently prefer Bernie Sanders on the issues. However, I respect Clinton’s experience and also think that it is time for the United States to have a female president. I just hope that she can quickly move to reform her campaign to bring more credibility to her progressive ideas. Previous Post:Survey: Do you believe in science?